In this contest, I want to feature and thank the very talented people who create wonderful 3d-content for us ~ the 3d-art vendors. I have great respect and admiration for their talent, work ethic, and general awesomeness! For those interested, here are the past winners. If you want announcements of site events and winners, follow us on Facebook. The Elysa Bundle really stood out for me, and I got it right away. OOT hairs are always super realistic and I love this particular hairstyle with its mix of braids and long straight hair. It is very suited for the type of fantasy pieces that I do, but also versatile enough to be used for other genres. Two other great hairs that I got are Side Layered Messy Hair and Lori Hair for Genesis 3 and 8 Female(s). Lori hair is absolutely adorable, and I used it on a Red Riding Hood character that I am very happy with. Will be trying out the Side Layered Hair as soon as I get some free time. Another big favorite of mine is Fantasy Skins for Genesis 8. There are many different options, and I like that it can be easily applied to any skin. With this utility, I am able to significantly expand the types of characters that I can create. I am a big fan of tattoos, so I also got Tatt’s All Folks! Iray decals is not something I have tried before, so it will be an interesting experiment. Will has a great tutorial here. Finally there are a few more items that caught my eye, including this very unique Carnivorous Plant. I think it will look great in a Poison Ivy render. 🙂 Skies of Gaia looks like a useful HDRi set. I have been looking for a mountains + sky set for a while now, so I can’t wait to try these out. Last but not least, Herschel Hoffmeyer’s Hell Creek Modules is detailed and versatile, so definitely a good tool to have in my backdrop toolbox. For April, we will feature some of our favorite March Madness artists. Images with the newly released Bridget 8, and Mrs Chow 8 will also qualify. 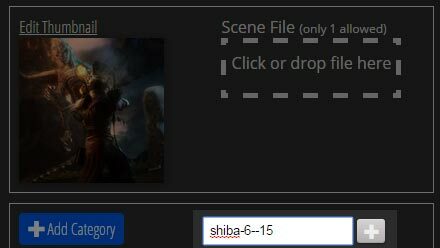 Please tag all your contest images with shiba-4-19. If you have ideas on how to improve the contest or other fun contests you would like to see, please let us know in the comments section below. If there are vendors you would like us to feature, also let us know. Shiba contest qualifying item used – Dakotaraptor by Herschel Hoffmeyer. I love gift certificates because they are easy to deliver, claim, and use. Prizes will all be in DAZ gift certificates. 1st Place – $50 Daz3D Gift certificate. 2nd Place – $25 Daz3D Gift certificate. 3rd Place – $15 Daz3D Gift certificate. Honorable Mentions – $10 Daz3D Gift certificate. Winners will be announced at around the 10th of the following month. Please remember to post a comment with your email in the monthly winners page to claim your GC. Anybody can enter except judges and organizers of the contest. Entries need to contain at least one item from any of the featured vendors. Each month will feature one or more vendors, but your entry only needs to contain one item from one of the featured vendors. Paladin HD MMXV by Luthbel. Old and new images are welcome. Entries can be submitted to other contests. Postwork is allowed and any software may be used. By entering this contest, you give us permission to post your contest images on this site, for example in an article announcing the contest winners. We want everyone to have fun, so there aren’t many rules or restrictions. The only real requirement is to include at least one item from one of the featured vendor stores. Links for the featured vendors and stores will be updated at the beginning of every month. To submit an image to the Daz3d gallery, click on MY GALLERY. 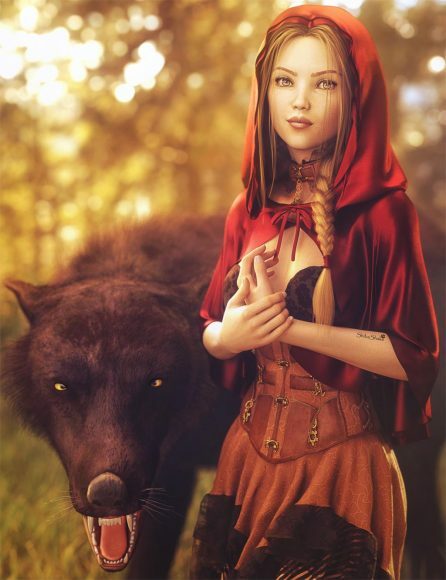 We will be using the Daz3D gallery for contest entries. To submit an entry, you will need to have an account at Daz3d.com. It is very simple to create, and takes very little time to make one. 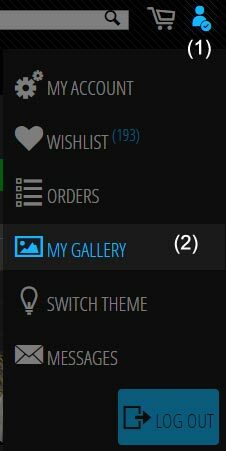 Then, click on your account icon to the top-right (step 1 in the image to the right), and go to MY GALLERY (step 2). Next, simply drop an image at the “drop image” icon, or click on it to load an image from your local directory. How to edit an image in the Daz3d gallery. 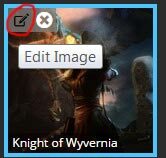 Hover your mouse over the image, and click on the Edit Image icon (circled in red to the right). In the description section of the image, enter in the qualifying items used for this contest. Qualifying images must contain at least one item from one of the current featured vendor stores. Enter the qualifying items used in the description section of the image. In the tag section of the image, enter the current contest tag. For example, shiba-6-15. Click on the plus [+] button to the right to add the tag. 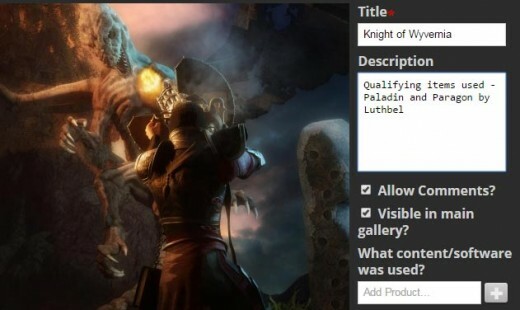 How to enter tags for images in the Daz3d gallery. Save your image, and that is it! And thank you for participating! If you have any additional questions, suggestions, or comments, please post them below. Poser, Daz Studio, Carrara - Which One Should I Use? Oh dear, was I too late? Greetings All. Well done on some lovely renders, past and present. Awesome sauce! So many fun entries this month. Thank you for sharing! Just wanted to ask, when it says any swimsuit (one-piece or bikini) does that also mean swimwear for the males? Or is it meant more as a female only month (with the exception of Floyd of course)? She is very beautiful! Thank you for sharing. Hope you kinda like it! Had to do a smaller image and the first one became just too big a file! LOL! I love your articles and this contest. Congrats on a great site. I’ve entered a few times in the past and will have few for this month. I even got and honorable mention a while back – surprised the hell out of me. Starting last month though, I’ve been having problems reading the site. It loads, but some of the text keeps disappearing, usually about which vendors can be used. I just spent a great deal of time doing some images based on the Karyssa Pro Bundle I just got as a belated Xmas present. You can imagine my consternation when when I came to the site today to see if the January winners were posted and found that Karyssa was not listed as a qualifying item. I know I’m getting old, I’m 68, and can have a certain amount of senior events, but I KNEW I saw it before. My adblocker/anti tracking software does not like this! The page becomes messed up which it would appear to cause the missing text. January started with some great sales on some of my favorite vendors including Stonemason, , and . This allowed me to pick up many items that have been on my wishlist. The newly released Owen 8 and will also qualify. As you can see in the first instance only Stonemason is listed and in the second only Owen 8 is listed. Please fix your site and remove the trackers. Or at least warn visitors that such items exist and may mess up the page. Hello Jeff! Thank you for visiting and participating in the contest. Sorry for the problems you are having with regards to your adblocker. We use affiliate links and ads on this site to fund site hosting, maintenance, and contest prizes, which can add up to quite a bit. Sadly, without these links, we would not be able to run the monthly contests. If you are having problems loading, you can try turning off adblocker for just this site. We have also added an affiliate message at the beginning of each post. Thank you very much for your understanding and patience. Happy new Year Shiba 🙂 i wish you the best. Happy 2018 to you as well. Hugs! Hi this is my first time entering your contest. I am not sure if the tag took or not? shiba-12-17 I see my image listed so hoping it’s correct now. Yeah, that works! Looking good! I am trying to reach the creators of the Shiba Shake web site. Your site is beyond incredible; I had been considering getting a Shiba Inu and the outstanding experiences and guidance you shared were instrumental in my wife and I getting one for our 20th anniversary. I notice with sadness that you appear to not be updating the site any longer with new content. My name is Glenn and I live in Miami, Florda. We have a 5-month old cream Shiba named Casper who we got at 12 weeks from a breeder in Missouri. He came to us fully potty trained, but afraid of everything and has thrived with many suggestions from your site. Hello Glenn, Thank you very much for your message. Congratulations on your Shiba Inu and big big hugs to Casper. Yeah, I have been spending more time with my pups, so have less time for my websites. 🙂 Time with them is very precious. Happy New Year to you all! Oh so many great vendors this Month too, I hope things will calm down so I can participate this Month. Ah and you might want to change the Month from November to December. I’ve noticed that days after the end of the month and prior to your announcement of the winners of that previous month’s contest, there are those who are posting/tagging entries for that month (e.g., It’s September but people were still posting entries well after August 31 for the August contest). Is that allowable. I’m just curious because there are times when I would like to enter but missed what I perceived as the deadline. Ohh that’s going to be a tough choice with all the great vendors. Question ? It says that Michael 8 qualifies, does that mean we can choose a vendor AND M8 or if choosing M8 we can’t choose a favorite vendor ? LOL that was a lot of using the word choose in one sentence, hope my question makes sense. Btw shouldn’t it say featured vendors for September instead of August ? Yeah should be September. Thank you much and updated. Does this mean that (for example) the August contest ends August 10th? Heh, 10th of the following month. Updated. Sweet! Still time to get in on it! Having lots of fun regardless of what the banner says. Ok, think I did it right on the submission! Lots of cool entries thus far! I love Rawart, I will take part in this one if I recover from my crash in time to get something done. Hi Shiba, Can images submitted for entry in the contest also be submitted in other (non-DAZ3D) galleries? Thanks. Well I don’t know about good. 🙂 Will enter my now rendering image then. It’s Vue so could take a day or so. YIPEE! Arki is one of them! There were a lot of awesome stuff released during MM and picking a favourite ,well nope can’t do it, too many to choose from. My head is still buzzing from all the great stuff I bought and I haven’t used half of it. Haha, yeah, I always find stuff in my runtime that I didn’t know I had. It is like getting an unexpected present each time. 😀 I must say tho that my fav. product currently is that Kadis armor. I just can’t stop using it. I can’t express how happy I am that I discovered ThinkArtDraw. The tutorials are extremely helpful and the art contest each month never fails to leave my jaw hanging open. I could spend hours just flipping through galleries oooooing and ahhing at the talent. Thank you so much ShibaShake for sponsoring this! Thank you so much for your wonderful words and also for participating in the contest! Wouldn’t be able to do it without all of you! Hugs! Okay, my render has made a few more days. Who says a butterfly doesn’t wield power. Hello everybody! Some lovely renders!!! Well done all! Woah, I might not be participating in the challenge. I see my image has been pulled from the gallery and deleted out of my account. How do I inquire or can you do that for me? Congrats on a wonderful site. You’re doing a wonderful job and your art is amazing. Well done. I’ve just recently rebuilt my system and installed all my art programs. I’m like an art junky, not knowing which software to tinker in. I realise I’m behind in Daz and it’s new, amazing renderer, hence my participation in your challenge this month. Hope it’s not to raunchy but what better way to test my skills with water. Needless to say, I’m tired of tweaking. Have a GR8T one. Keep up the good work. three fantastic vendors to choose from…can i resist the temptation to pick an item from them all? should i even try? it’s a wonderful concept, this contest. i must’ve visited for TDA tutorials half a dozen times before i spotted it. thanks for hosting, shibashake! so…is there a way to check out the results of the october contest without facebooking? once upon a time i facebooked, but i facebook no longer. turned out i was allergic to it. can i resist the temptation to pick an item from them all? October results are not posted yet. Will be posted soon on this site, so will be accessible to all. I use Facebook and Deviantart for announcements on new things posted. Yes, i did it, i added a entry for the contest, my first one ever…:D Good luck for everyone!! Ohh the possibilities with a Daz Originals month. There were a lot of awesome items released in the PA month and I also got some “old” ones from my wishlist. My favourites from the PA month would be everything I bought, including the stuff from my wishlist …. lol…. On the top of the list though is definitely Terradome and TerraLuna. I hear you on that one. Got some really great deals and could have gotten a lot more…But…my creditcard doesn’t agree with me on that one, being a single mom and all lol…at least I don’t have a spouse breathing down my neck , only kids looking at me like I’m crazy from time to time when I drool over stuff I would like to get. Good luck to everyone this month! My parents are coming to visit from out of town and I ran out of time. I was going to go with Fred Winkler, I just love all of his characters! My Question: Does the Fennec Fox count too, based on his Fox Model? Yes it does because it uses the Foxes as the base. 🙂 So you would list as your featured item Foxes by AM but you can use the Fennec Foxes as an additional item as usual. Hmm, can I use Fred Winkler Art again? He has so many great characters and I have a lot of them heh. If I can use FWA, am I only allowed to use the items he created alone, or can I use like say FWSA characters? Yes! Feel free to pick whichever vendor. I am certainly a very big fan of Fred. 😀 And yes, there can be others on the product as long as Fred is in there, i.e. it is in his Daz store. OK awesome! Of course I’ll be doing a new Harley Quinn, lol. Although, I did get the Terradome! Ohh great choice of theme for September. Except I’m going to have a difficult time choosing a favourite vendor lol.. So many to choose from. I assume the featured vendor items have to be from their DAZ store ? Yeah I know right, I have sooooo many favorites. In the past I know it had to be from the DAZ store. Oh boy and I almost had decided which vendor to use , but todays sale made me re-consider all over again lol. Didn’t get to submit as many pics as I wanted in June ;/ I have so much DM stuff but I spent far too much time working on the Caught picture. So that Suicide Squad contest, all I see is hand drawn stuff. Im not sure what this means really, “All submissions must be original artwork (meaning not using third party pre-existing copyright materials).” Like we can use 3D stuff right, do you think, it would be just like any other contest I enter? Sorry, guess maybe I should ask them lol! I have a few ideas for July’s contest 😉 I just love these. Yeah probably best to ask them (Warner Bros.). I just figured it was ok to use Daz stuff since Daz put it in their newsletter and offered an additional 1k GC for winners. Btw. feel free to share your submission links here. I would love to see! Finished my entry! Man did it take me a long time. Had to make new textures for all the clothes, added blood to Harley’s bat, and kept changing my mind on what hair I wanted to use. Here’s the link, but I think we cant look at the entries after they start judging. Not sure heh, I made it with 2 hours to spare! Wow! All the textures are fantastic! The bat looks amazing! Thanks 😉 I’m thinking of doing a bunch of female hero and villain pics. I love all your entries! I think my fave is Hammer Time! Awesome! I have a ton of stuff from DM actually going back to 2002! Just got a few more yesterday even, looking forward to using the Drake Tower! Do you want us to only use the products we got from DAZ? Check out the “Contest Entries” link at the top. If you tag it right, it will appear in that gallery. Thanks for entering! Hi Shiba, does one have to use DAZ Studio to qualify or can you use a different application as long as a qualifying item is used? I am starting to work with a different app (still love DS) but it is work related and limiting my time using DS at the moment. Ha… I’m laughing ShibaShake… Like you once Daz made punches permanent… my purse got emptier and emptier! chaa chiiiiiiiiing!!! Haha! I am glad I am not the only one. 😀 Happy New Year to you! Last year just flew by. Many vendors sell on multiple sites. In past contests you have included vendors’ listing on RDNA. Can you use models by the listed vendors purchased from other sites in September’s contest? In general, qualifying products are only those that are in the posted featured links. Since September is Vendor month at DAZ, we wanted to keep it mostly to daz stores. Also, we are using the Daz Gallery and doing Daz GC as prizes, so Daz Vendors will generally be the focus. However, on regular months, we usually include vendor stores from other places as well, in which case they will be listed in the featured vendors section. Do you buy all the stuff in your renders or some items are free? Daz does offer a bunch of free items – Daz Freebies page. Judges should be able to look at the image and recognize parts of the qualifying outfit. Great artists you listed there! Will certainly give it a try! this sounds like a lot of fun!! do we need to post here to let you know, or do you find the images just by searching tags in teh daz gallery? Link to current contest entries. Thank you for this contest and what a great idea that the items used in the images need to be vendor based. Great idea! This will be fun!